Were you itching to see more desis on reality TV? Even if you weren't, you are going to get them anyway! The BBC announced today that the clinician and TV presenter Dr Ranj Singh will be part of its blockbuster show Strictly Come Dancing 2018. Also today, Channel 5 revealed that presenter and comedian Hardeep Singh Kohli was joining Celebrity Big Brother. Dr Ranj Singh is a presenter on ITV and a NHS doctor, focusing on health and wellbeing of young people. He became a regular fixture on TV after co-presenting shows such as ITV’s Save Money: Good Health and CBeebies’ Get Well Soon. "I've been a massive fan for so long, and I can't quite believe this is happening, but I'm going to give it my best shot," he said today. "Anyone that knows me knows that I love a bit of sparkle... so bring on the glitter! I can’t wait!!" Hardeep Singh Kohli has joined the Channel 5 show as its 14th's mystery housemate, according to The Sun today. He was at the Edinburgh Fringe Festival before cancelling at the last minute with this tweet: "Sincere apologies for the cancellation of the rest of my fringe run. A last minute TV project came up." 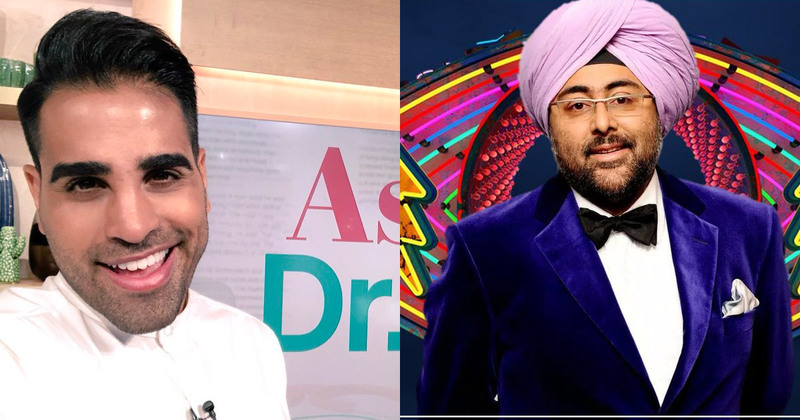 Kohli was recently a presenter on BBC's One Show and has also appeared on: It'll Never Work, Meet The Magoons, Celebrity Masterchef, and co-hosted New British Kitchen on UKTV.